It grows to 20–50 cm (8–20 in) tall, with pinnately divided, thread-like, alternate leaves. The flowers, blooming in early summer, are most commonly different shades of blue, but can be white, pink, or pale purple, with 5 to 25 sepals. The actual petals are located at the base of the stamens and are minute and clawed. The sepals are the only coloured part of the perianth. The seed capsule becomes brown in late summer. The plant self-seeds, growing on the same spot year after year. This easily-grown plant has been a familiar subject in English cottage gardens since Elizabethan times, admired for its ferny foliage, spiky flowers and bulbous seed-heads. It is now widely cultivated throughout the temperate world, and numerous cultivars have been developed for garden use. The related Nigella sativa (and not N. damascena) is the source of the spice variously known as nigella, kalonji or black cumin. The colour is wonderful. Enjoy your weekend! What a beautiful flower especially the blue color! love the very artsy heart of this flower. Not to mention, blue rocks! A beautiful bloom and capture, Nick. I love the vibrant colour and layers of this striking annual. (Hoping you can help out in identifying the flower I've posted!) Thanks for hosting and trusting you have a great weekend . 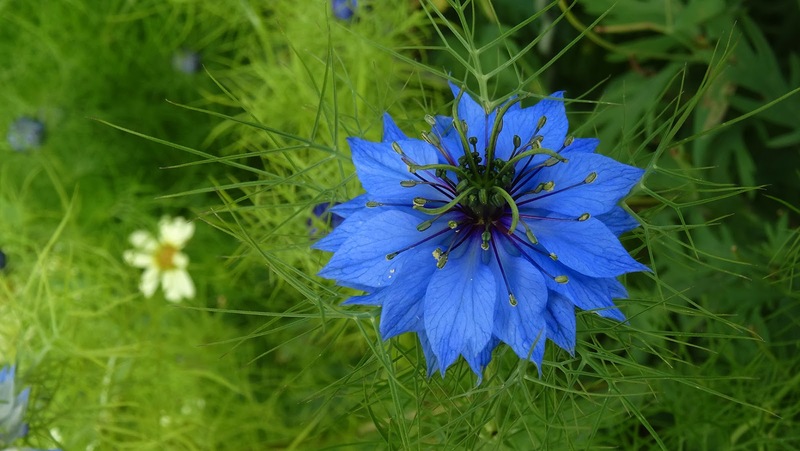 This lovely blue flower certainly has some intriguing stories attached. Love how the petals are veined like a leaf. This is lovely. Thank you for sharing and hosting. Happy Friday! These used to grow a lot in the wild here in the UK but now I only ever seem to see them in gardens - such a shame as they are lovely flowers and the colour is georgeous. Love your capture - stunning colour! Beautiful flower, lovely colour and a great picture!! Oh, how I love 'Love in the mist'. Such a beautiful photo too.